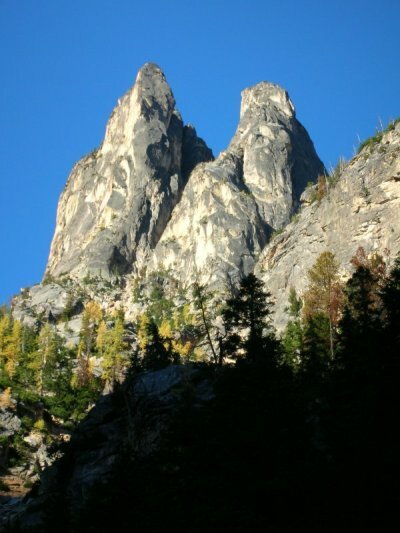 The Early Winter Spires from Highway 20's hairpin turn below Washington Pass. South Early Winters Spire is on the left. A climb this striking about a half mile from the road demands attention. We climbed it as two parties of two. Ross and I were beginning to wonder what had happened when Tony and Justin finally joined us atop the highest peak of the Liberty Bell group. Climb a roof; climb a chimney; climb another roof; climb a bolt ladder; climb a thin crack; this is a fun-filled climb.